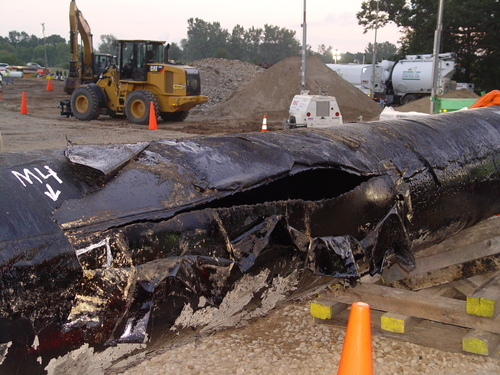 Over the last year we’ve had many recent indications of the risks of tar sands diluted bitumen pipelines – an 840,000 gallon spill in Michigan, a 250,000 gallon spill outside Chicago, a 1.3 million gallon spill in Alberta, as well as our recent report examining the safety of tar sands pipelines. On May 7, the Keystone tar sands pipeline provided yet another warning when it spilled approximately 21,000 gallons of crude in North Dakota. This is its eleventh and most significant spill. Considering that Keystone has been in operation for less than a year and it was predicted to spill no more than once every seven years, this is yet another troubling indicator that U.S. safety regulations intended for pipelines moving conventional oil may not be sufficient for pipelines moving diluted bitumen. And the Keystone pipeline is not going to get any stronger or safer than it is now, as many of the risks associated with hot diluted bitumen piped at high pressure - including corrosion, abrasion and stress corrosion cracking – only weaken pipelines over time. One has to wonder whether the leaks in the new Keystone pipeline are our canary in the coal mine, portending worse things to come. This is why the State Department's superficial review of the safety concerns for Keystone XL, a proposed tar sands diluted bitumen pipeline that is currently routed through the Ogallala Aquifer, is so concerning. We should not permit Keystone XL until we give our pipeline regulators a chance to catch up and develop the appropriate safety standards. The spill occurred at a pump station when a ¾-inch pipe fitting broke, sending a 60 foot geyser of tar sands crude into the air. At approximately 6 am, a nearby landowner saw the column of crude rising above the treeline and called TransCanada’s emergency number – where operators apparently initially thought he was joking. Let’s put the latest Keystone spill in perspective. Between 2002 and 2010, the U.S. pipeline system, which includes approximately 55,000 miles of crude pipelines, had only two leaks of 21,000 gallons or more involving pump station valve failures. And the system is over forty years old on average. Meanwhile, the brand new 1,070 mile Keystone has had one such leak in less than a year of operation, as well as ten smaller ones. So what do these pump station failures tell us about Keystone and other heavy diluted bitumen pipelines? As the U.S. spill records show, failures of this kind and magnitude are not common occurrences in our conventional pipeline system. That the failure of a ¾ inch fitting resulted in a 60 foot geyser that spewed over 21,000 gallons of oil in a matter of minutes paints a pretty clear picture of the kind of pressure these pipelines are under. That the pipeline fitting failed in ordinary operating conditions suggests that it was not built to withstand that pressure. Diluted bitumen is very viscous, or thick, and requires enormous pressure to move through a pipeline. Keystone operates at 1440 pounds per square inch (psi) of pressure. Pressures above this can occur in the course of a diluted bitumen pipeline’s operation. For instance, let’s say that a pipeline’s spill monitoring system suddenly registered a drop in pressure – in a conventional pipeline, this would usually signify a leak. With a diluted bitumen pipeline, it in can also occur as natural gas liquid goes from liquid to gas form, creating a bubble that blocks the flow of oil. If operators treat the signal as a leak, safety valves shut down the oil flowing to and from nearby pump stations… but like a train, the oil doesn’t stop the moment you put something in its way. At one end of the pump safety valve, you have a column of heavy, thick diluted bitumen that may be up to thirty miles long, traveling at high pressure. Closing a valve creates a veritable trainwreck inside a pipeline, a phenomenon called ”fluid hammer,” that can cause pressures to go well above a pipeline’s operating pressure. Now to the case at hand. There are some interesting timing issues here. First, TransCanada says that its workers detected a drop in pressure at the pump station at 6:05 AM and proceeded to close the valve. In its report to the National Spill Response Center, TransCanada stated that the actual leak occurred at 6:26 AM – after, and possibly due to, the valve closure. That a pipeline failure occurred is a matter of public record. But this suggests that even the safety systems in place on the Keystone pipeline may not be adequately engineered to withstand the high pressures they are subjected to in the course of routine use. This should be a wakeup call to our regulators and the pipeline community. These failures are an early sign of trouble – and will likely only get worse as time goes on and risks of internal corrosion, stress corrosion cracking and pipeline abrasion continue to develop. The recommendations we made in our report on tar sands pipeline safety are timely. U.S. pipeline regulators should thoroughly evaluate the risks of diluted bitumen pipelines and develop the necessary regulations to mitigate those risks. Meanwhile, new diluted bitumen pipeline projects like Keystone XL should be put on hold until those new safety regulations are put in place. Rather than ignoring the problem and doubling down on diluted bitumen pipelines by permitting Keystone XL, we need to give our regulators a chance to fully study the risks and develop the appropriate regulations to address them. After all, every miner knows - you don’t sign up for a double shift right after your canary has just died. Ask Secretary of State Clinton to halt the permitting of Keystone XL so that concerns like these can be addressed.